When the Hutto family of Homewood wanted to create the perfect lakeside getaway, they didn’t turn to architects, designers and construction crews. Instead, they went “shore shopping” around Smith Lake. and over the years, the family didn’t just watch their dream lake house take shape–they built it with their own hands. From the door that was made out of the children’s old sandbox to the handrail constructed from driftwood, the 1,000-square foot home in Cullman reflects the hard work, ingenuity and love David, Kursten, Madison and Dylan put into its custom design. “Working on the house brought our family together with a unified goal, and it taught us so much,” Kursten said. The family discovered the two-story house while looking for a house to buy on Smith Lake in 2006. For David and Kursten, their first glimpse at the lake house proved to be a moment of love at first sight. “As soon as we pulled up into the driveway, we both said that the house was exactly what we were looking for in a lake house,” David said. 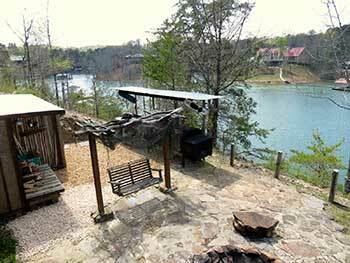 And what the Hutto family was looking for was a retreat on Smith Lake that offered them not only a place to spend quality time with friends and other family members but an opportunity to flex their creative muscles. The renovation of the lake house gave the family plenty of chances to put their creative do-it-yourself skills to use, David said. Instead of a Miami Beach vibe, the Hutto family sought to bring a more rustic feel to the home and embrace its natural setting, Kursten said. “We really wanted it to reflect the natural beauty of Smith Lake and be a casual and comfortable space for all of our friends and our family,” Kursten said. To that end, the family started from the ground up and transformed the three-bedroom house, one project at a time. The cinderblock house’s exterior was covered in siding, which David promptly removed. One of the family’s first priorities was creating a backyard space to gather in the evenings. “The first weekend we were up there, we dug the fire pit. The house sits on a bluff, and we wanted as many ways to take advantage of that view as possible,” David said. The fire pit quickly became a favorite spot for hanging out with their neighbors on the lake or spending quiet moments after company had gone home, Kursten said. “We love to sit out there at night and just look up at the stars and listen to the sounds of the tree frogs and the whippoorwills,” she said. The backyard area also includes an outdoor kitchen with a custom grill and a smoker that is called Bubba’s Bones. A swing Kursten received from Madison and Dylan for a Mother’s Day gift offers guests a place to take in the view of the lake while they wait for David to serve up his Bubba’s Bones specialties. The backyard area also has an outdoor shower that the family and their guests use to rinse off in between dips in the lake. The shower is made of materials that Kursten salvaged in Homewood. Kursten said she’s always been one to see the potential in things others might discard. Kursten said before they bought the lake house, David would also tease her about the things she would find and bring home. “I remember one time, a man was asking David what we were going to do during one of our home improvement projects, and David told him that it all depended on what I found on the side of the road,” she said. But after the family bought the lake house, David started seeing things from his wife’s perspective a little more. “If you give yourself the freedom and flexibility to look at the possibilities and you have a blank canvas, you can do all sorts of fun stuff,” David said. Kursten and David said they were always on the lookout for items they could recycle and use in their renovations. “We’d get out on the boat and go visit our friends around the lake, and we’d always come back with something that caught our eye to use in the house,” Kursten said. One day, David discovered that someone had discarded a broken dock, cutting it from its tethers and letting it float down the banks of the lake. An old deck railing that washed up on the shore was transformed into a headboard for Madison’s room, and a discarded skim board was used to create a fun decoration for Dylan’s room. “David found this old broken skim board that someone had thrown away, and he cut parts of it out to make it look like it had been bitten by a shark, and now it’s a fun little piece hanging from the ceiling in Dylan’s room,” Kursten said. The ceiling in Dylan’s room shares a connection with a Birmingham area chef, Kursten said. “Chris and Leslie Dupont live down the street from us in Homewood, and they were throwing away an old fence that we used on Dylan’s ceiling,” she said. A piece of a log Kursten and David discovered on a walk around the beach is now a handrail on a staircase leading to the second floor of the house. While some of the materials used in the renovation were easy to come by, the family said they definitely had to put in some work to make other parts of their dream lake house come together. Kursten said by the time she finished getting the paint off the kitchen cabinets, she was “dreaming in pink” and ready to move on to the next project. The couple also replaced the countertops in the kitchen and added a personal touch before they sealed them. During the renovations, David discovered an old terra cotta pipe flume, which led him to believe that at some point the house had been heated with a wood-burning stove. “When I saw that, I knew we needed a wood-burning stove in the living room, and it really adds to that cabin feeling,” he said. David tore out all the sheetrock throughout the home’s interior and replaced it with wood. He pulled up all the carpet and put in pine hardwood flooring, renovated the half bathroom downstairs and rebuilt the staircase going from the first to the second floor. The staircase offered David another chance to incorporate a unique feature in the house, Kursten said. The home’s rustic theme continues in the bathrooms, which has sinks made out of galvanized tin buckets. The shower floor in the master bedroom features smooth pebbles the family collected on the shores of Smith Lake. The lake house boasts a ton of rock work–literally. From the fireplace in the living room to the backsplash in the kitchen to the mountains of stone used to construct two rock columns that go up two stories, every single piece was hauled from the lake by hand, Kursten said. And while hauling up enough buckets of rocks for all the stonework in the house was tough, the family said the most challenging–and rewarding–project in their lake house renovation involved moving a mountain. Kursten said the whole family really invested in moving the dirt and the rock, and it became a common goal they all worked to accomplish. After a few months, the digging was done, and David said he knew his children had learned something in the process. “It showed them that they can move mountains, that there’s no obstacle they can’t overcome through hard work,” he said. David said he thinks Madison, 20, and Dylan, 17, also learned the satisfaction that comes with putting in a hard day’s work. “It was really exhausting at times, but it’s such a rush to see your progress after you’ve worked hard all day at something besides pushing paper behind a desk,” he said. Now that Madison is in college and Dylan is about to begin his senior year in high school, Kursten and David said they’ve decided to sell the lake house. It’s a choice that leaves Kursten a little teary-eyed, she said. Kursten said the lake house will always hold a special place in her heart because of the connection it provided to her mother and to David’s mother. David’s mother passed away about five years ago, Kursten said, but visited the lake house several times. “We cherish the memories we made with David’s mom there,” she said. Kursten’s mom passed away in 1985 and never got a chance to see the lake house, but Kursten said she has felt her mother watching over her there. Kursten said she hopes the next family to live at the lake house will experience the joy her family found during their time on Smith Lake. “I wouldn’t take anything for the years we’ve spent here, for all the memories that we’ve made here with our children, with our families, with our old friends and our new friends, but it is time to give it up so that someone else can enjoy it,” Kursten said.